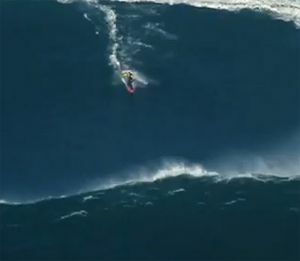 Hawaiian big-wave surfer Garrett McNamara rides world’s biggest wave at Nazare, Portugal. The wave caught by McNamara is estimated to be about 90 feet (30 meters). The coastline is home to a deep water canyon which funnels large swells from the Atlantic Ocean, creating record-breaking waves such as the one McNamara rode. McNamara was being towed into waves with UK surfer Andrew Cotton and Ireland’s Al Mennie. McNamara was surfing in the area as part of a study into why the waves reach such hugh heights. “I feel so blessed and honored to have been invited to explore this canyon and its special town. The waves here are such a mystery”, Garrett said.